The Monadnock Folklore Society presents the Peterborough, NH First Saturday Contra Dance on March 2, featuring Luke Donforth calling with the band Anadama. Contra dance is a fun, relaxed style of folk dance which has flourished in New England since the 1700s. Partners form lines and dance a short sequence of steps with their neighbors. Dancers are welcome to bring a partner or a group of friends, but it’s not necessary – traditionally, dancers are encouraged to change partners throughout the evening. 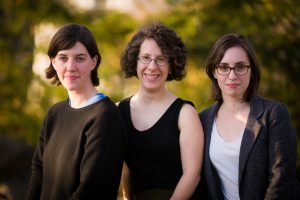 Anadama is Amelia Mason (fiddle), Emily Troll (accordion), and Bethany Waickman (guitar). The trio finds its roots in the traditional music of New England, Ireland, and Quebec. Infusing old and new tunes alike with a distinctly modern kick, it is dynamic, earthy music. Dance caller Luke Donforth started contra dancing a decade ago in New York and has called and shared his love of contra dancing from California to Texas to Vermont. He’s an emerging choreographer of new dances, and draws on the wealth of dances and dance traditions from everywhere he travels. The dancing begins at 8:00 PM. The dance also hosts a free jam session for beginning and intermediate musicians at 6:30 PM and a workshop for new dancers at 7:30 PM. Admission is $10 or $7 for students and seniors. The dance takes place in the historic Town House in Peterborough, NH at 1 Grove Street. For more information call 603.762.0235 or visit www.monadnockfolk.org. The Monadnock Folklore Society has presented contra dances and concerts of traditional music since 1982.